Chettinad Kathirikkai Chops recipe with stepwise photos. 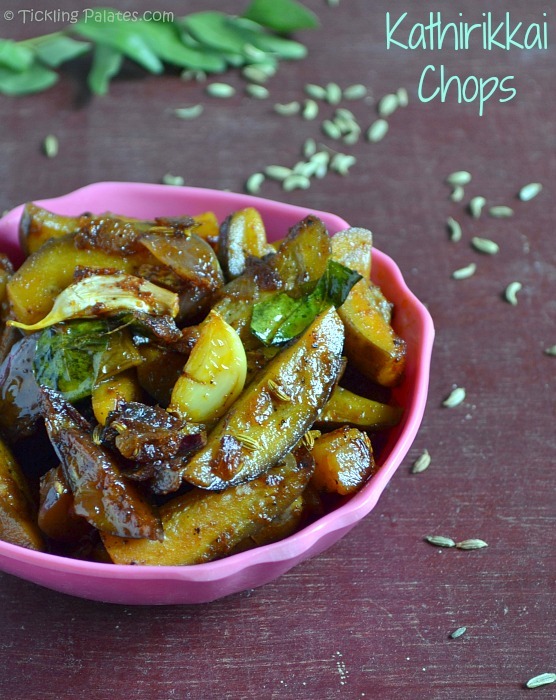 These brinjal chops is a spicy dry curry that goes very well with both rice and chapathis. Its lip smacking to eat with rasam rice especially during rainy time. Kathirikkai chops is of the chettinad origin and this recipe takes very few ingredients and also easy to make as its takes very little time. 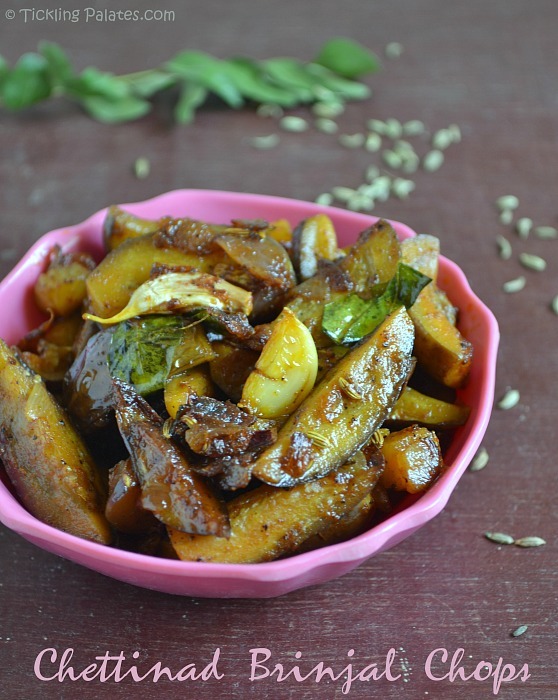 If you are looking for a simple brinjal curry to serve then this is the one for you. Though I do love Baingan Bharta & Kathirikkai Thokku, I do not like to eat brinjal if it gets way too mushy and loses it shape, especially in this chops recipe. So if you are like me, then take care while cooking and avoid over mixing the brinjal while they cook. 1. Heat a pan with oil. Add fennel seeds and let it sizzle. Add crushed garlic pods, green chili and saute for 10-15 seconds. 2. Add chopped onions, curry leaves and saute till the onion turns translucent. 3. Take out the brinjal pieces from water, drain well and add it to the pan. Saute for 2-3 mins over low flame till the brinjal pieces wilt and soften. 4. Add red chili powder, turmeric powder, black pepper powder, salt and mix well. 5. Add 1/8 cup water, mix well and close with a lid.Cook over low flame mixing in between till the masala becomes dry and the brinjal gets cooked well. 6. Switch off stove and transfer to a serving bowl.Serve this chettinad kathirikkai chops as an accompaniment with hot rice. It also goes well with Chapathis. Adjust the spice level according to your taste buds. This is supposed to be a spicy curry. If you feel it might be too spicy, then omit either green chili or black pepper powder. Do not add more water more than necessary and also do not keep mixing too much & often. This will make the brinjal to become mushy and it will not hold its shape. If you do not wish to add fennel seeds then replace it with cumin seeds. 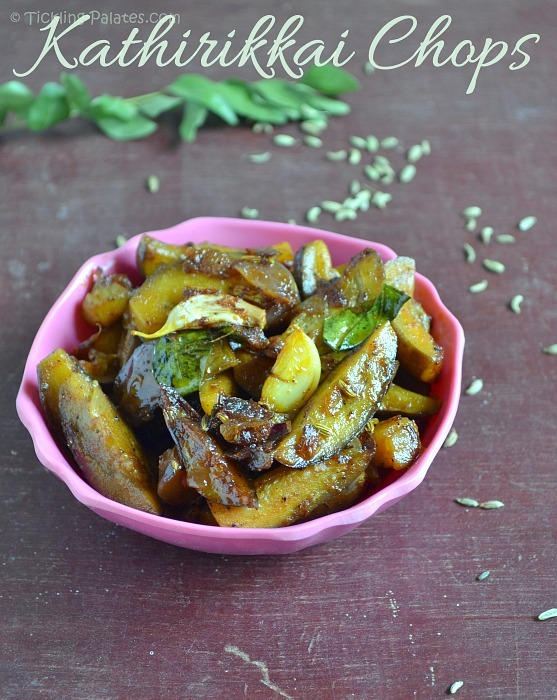 A spicy, dry curry using brinjals chops that goes very well with both rice and chapathis. Remove the cap from the brinjals. Cut them into half lengthwise and further slice them. Keep the pieces immersed in water to prevent discoloration. Chop the onions finely. Cut the green chili into 2 or 3 pieces. Heat a pan with oil. Add fennel seeds and let it sizzle. Add crushed garlic pods, green chili and saute for 10-15 seconds. Add chopped onions, curry leaves and saute till the onion turns translucent. Take out the brinjal pieces from water, drain well and add it to the pan. Saute for 2-3 mins over low flame till the brinjal pieces wilt and soften. Add red chili powder, turmeric powder, black pepper powder, salt and mix well. Add 1/8 cup water, mix well and close with a lid. Cook over low flame mixing in between till the masala becomes dry and the brinjal gets cooked well. Switch off stove and transfer to a serving bowl. Serve this chettinad kathirikkai chops as an accompaniment with hot rice. It also goes well with Chapathis. Brinjal chops looks delicious ! Delicious and lovely looking chops. Excellent preparation. Delicious and yummy brinjal chops. Love brinjal in any form. 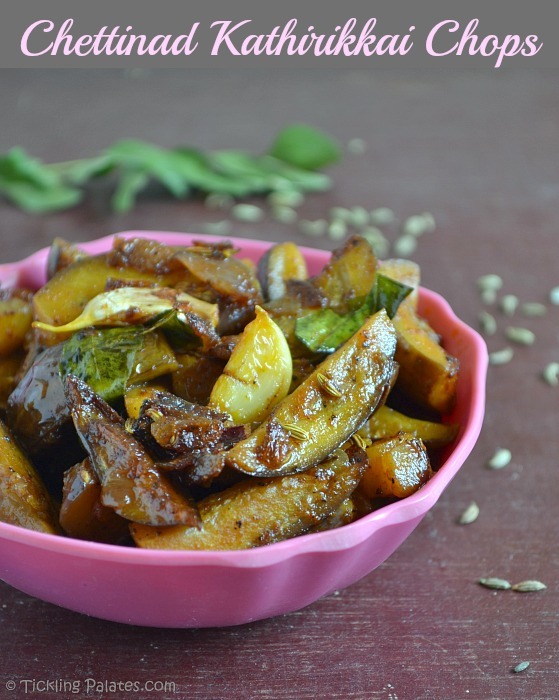 Absolutely delicious stir fried brinjal. Looks really tempting.i just had lunch wish i had some chops too. super like for the pepper that goes into it.